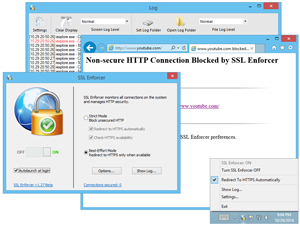 ﻿ SSL Enforcer - Force SSL/TLS encryption for any browser or app. Block all unsecure connections. SSL Enforcer ensures that you are using the best possible security everywhere. It can block unsecure HTTP connections, check for secure alternatives (HTTPS) and redirect the connections accordingly. The processing is automatic and transparent for the user apps. Works system-wide. Supports all apps including browsers, plug-ins, email, etc. Can block unsecure SSL/TLS versions and cipher suites. Does not use a tunnel or proxy server. Does not affect your transfer rate.